Sunday October 28th 1883. I was busy about the work all the forenoon. I wrote to Mother in the afternoon and played on the piano at night. Monday October 29th 1883 It was a splendid day. We got the washing and most of the ironing done. I finished spicing apples and baked cake. I knit in the evening Tuesday October 30th 1883 I went to town the first thing this morning for some groceries. I got home in time to work some in the garret before dinner We soon finished it after noon I worked cutting up old things till bed-time. 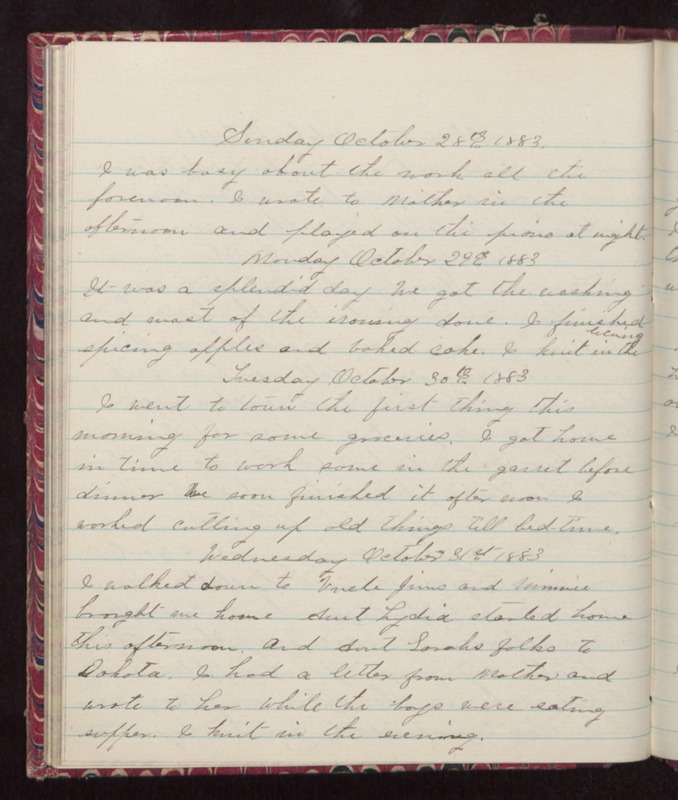 Wednesday October 31st 1883 I walked down to Uncle Jims and Minnie brought me home Aunt Lydia started home this afternoon, and Aunt Sarahs folks to Dakota. I had a letter from Mother and wrote to her while the boys were eating supper. I knit in the evening.